Welcome to my shopping street! 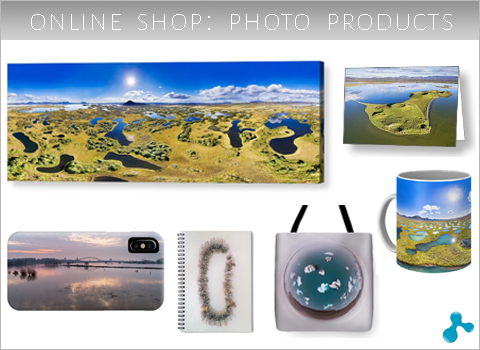 Now you can buy photo products with my aerial photos and panoramas as wall art (prints, canvas, posters), greeting cards, bags, phone cases, spiral notebooks, shower curtains, mugs and more. Worldwide delivery with a 100% satisfaction guarantee. Are you inspired? 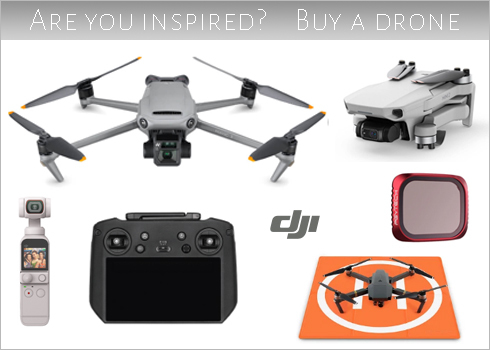 Buy your own drone (Mavic, Phantom, Spark, Inspire), CrystalSky monitor or other accessories at the official DJI Store and save a 1% credit for your next purchase. DJI ships to many countries in Europe, North America, Australia and eastern Asia. For professional use you can license my photos. Please use my contact form and indicate the photos and intended use to get a quote. Do you not find what you are looking for? I can also make photos and panoramas in commission, both in the Netherlands and in Iceland. In a 360° panorama you can look around in all directions including up and down. You can license my 360° panoramas at 360Cities in a very high resolution. Then you can embed the panoramas in your website or app - or use them in advertisements or billboards. all photos/panoramas © Paul Oostveen.